Selecting the right gift for that special person isn’t always easy. We hope that you’ll find inspiration in our range of shooting gifts, farming gifts, presents for dog lovers and gift ideas for country folk. Many of our customers enjoy shooting and beating so our range of shooting gifts reflects this. Whether you’re looking for ear defenders, position finders or game carriers we stock them. Cartridge bags and gun slips make popular gifts, whilst our Bryn Parry shotgun certificate holder with its unmistakable Bryn Parry cartoon is sure to appeal. With a matching Bryn Parry flask also available you immediately have a gift with a difference. Ties and cufflinks with a shooting theme are always welcome gifts. We can provide shooting ties and cufflinks on their own or you can choose a shooting tie and cufflinks set in a gift box. You may even want to match a shooting tie with a tie clip. Children are not forgotten and we are proud of our range of children’s shooting ties and our children’s shooting clothes in general. Shooting socks and garters are another popular present combination. We aim to keep a selection of colours, yarns and prices to suit all tastes. Our range of Alex Clark gifts will appeal to many of our customers, with tea towels featuring pheasants, cows or helpful dogs! The farming theme continues with a matching apron and oven gloves, whilst ladies will be sure to love Alex Clark’s pheasant or muddy dogs canvas bags. If you’re searching for a more practical gift for dog lovers, then dummies, dog leads, whistles and lanyards are always useful. Dog training books are carefully selected to provide advice to both the novice and more experienced dog trainer. Mugs with dogs on are always popular and we regularly try to update our range. China from Lucy Green Designs makes a thoughtful and unique gift. 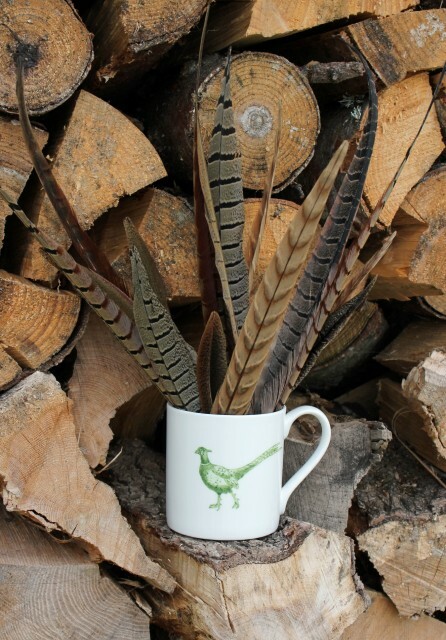 Choose a favourite mug from Lucy’s Farmlife or Country Sporting range or put together a Lucy Green Designs mug, plate and bowl to create an individual place setting for a special gift. Aprons, oven gloves, tea towels and napkins are also now available from the Lucy Green Designs Farmlife range. Designed in Dorset, they really are a gift with a difference. A tweed handbag is always a welcome present for a country lady. We also have a selection of ladies gloves as well as faux fur hats, headbands & cuffs. Our ever changing selection of country scarves and ladies’ socks are a favourite choice as a gift. Do take a look at our gift section and discover for yourself our selection of shooting gifts and country gifts.